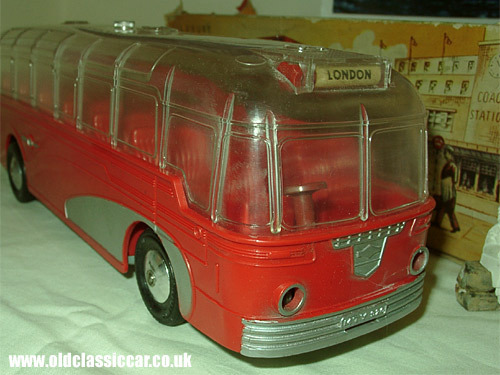 This is another example of a classic British toy from Alan's collection, in this case a Mettoy Motor Coach, probably dating to the mid/late 1950s. Made in England, it is probably based on one of the coachbuilt vehicles of the day, perhaps an AEC. 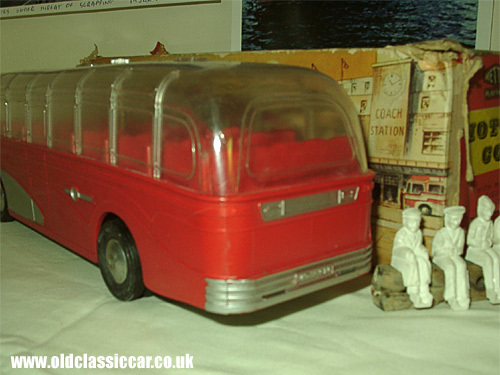 Note the artwork to the box in the background, providing a coach station as a backdrop along with some passengers ready for their day-trip. It measures approximately 15 inches in length, and has a friction-powered motor installed. The top section lifts off, allowing you to install the passengers and driver. If you look closely you can make out real bulbs in the front 'headlamps' which is a nice touch, especially when playing with the coach at night! The destination can be set to either London, Glasgow or Edinburgh. The Mettoy factory was actually set up in 1933, located in Northampton, England, by a German who had emigrated from his homeland.